Calculating how much revenue — or profit — commercial vendors wring out of open-source software is a tough nut to crack. It’s also hard because the revenue models for open-source software vary widely. Some companies charge for support; others offer both an open-source (i.e. “free”) version of the software under an open-source license and sell a commercially licensed version; some offer professional services; some combine one or more of these models. It’s complicated. One thing is clear; enterprise IT vendors accustomed to reaping fat margins on up-front sales of software licenses and then healthy margins on yearly support and maintenance re-ups, will have a very hard time replicating that profitability in the open-source world. For one thing, big customers moving to open-source are doing so at least in part to get away from that old model, which they deem as onerous, if not downright punitive. They don’t mind paying for stuff necessarily — in fact, they like the idea of an accountable vendor — but they don’t like being strong-armed into paying for stuff they don’t need or use. On the other hand, it’s very hard for vendors to profit off of free software. For more on this check out a really interesting blog post by Dave Kellogg, CEO of Host Analytics, based on his analysis of the Hortonworks S-1 filing last month. In his view, the only company in the open-source realm to build a significant business on open-source software is [company]Red Hat[/company], and even Red Hat is itty-bitty compared to [company]IBM[/company], [company]Oracle[/company], et al. But back to OpenStack specifically. How much money are the dozens (and dozens) of self-proclaimed OpenStack companies making? As a gage of participation, the OpenStack Foundation has 8 Platinum members; 16 Golds and 87 Corporate Sponsors for a total of 111 official stakeholders. But getting real numbers out of any of them on their revenue is a tough task. Luckily, for this Week in Cloud report, 451 Research took a stab at it and last week issued estimates on the revenue picture for OpenStack. It’s call? OpenStack revenue will hit $3.3 billion in 2018, up from about $883 million this year — a 40 percent compound annual growth rate over those four years. It surveyed 60 OpenStack players and its figures include both public and private cloud. It said current revenue comes mostly from 30 of those 60 comapnies. Opinion differs but I would bet [company]Mirantis[/company] and [company]Rackspace[/company] are the two companies now making some dough off of OpenStack. The rest? Well, it’s still early days. Whatever you think of OpenStack, it does seem to have won the branding and marketing war when it comes to open-source cloud frameworks. That’s so although even some OpenStack proponents concede that CloudStack is a more mature solution. “If you want cloud now, you could go with CloudStack, but these vendors are buying into the future, which appears to be OpenStack,” said Jay Lyman, research manager for cloud platforms at 451 Research. If you take the $3.3 billion as gospel, and divide that by the 60 companies surveyed, that’s $55 million per company in 2018. Not chicken feed but not a blockbuster either. But most onlookers agree that the number of OpenStack vendors is in flux and that the consolidation we’ve already seen — Cisco buying Metacloud, EMC buying CloudScaling, etc. will continue. It just does not seem feasible that there is room for a hundred or more vendors to profit from this technology. 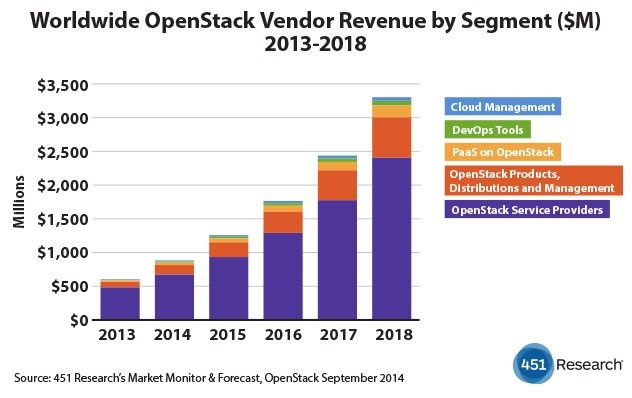 And, to be fair, skeptics find both the current and future revenue totals for OpenStack to be wildly optimistic. We’ll have to check back in a few years to see what happens and hope that by then the vendors will be more forthcoming about real numbers. One can hope, right? Other than the OpenStack melee, most cloud watchers keep their eyes on [company]Amazon[/company] Web Services, [company]Microsoft[/company] Azure and [company]Google[/company] Cloud Platform. If you want an informed opinion about the relative merits of all these players, who better to ask than the CEO of a multi-cloud management company? So we did. This week’s Structure Show guest was Sebastian Stadil, founder and CEO of [company]Scalr[/company] and he has some interesting thoughts not only on the big three but on other clouds from Oracle, [company]Joyent[/company] etc. Don’t miss it. Comparing the profitability of any Open Source company with that of IBM or Oracle is Apples to Oranges comparison, IMO. They play the game of different economics. OSS companies play in the economics of abundance where they compete with free as in beer whereas proprietary companies compete in economics of scarcity where IP protection is effectively used to make space for high margins. OSS is a hard game but it is the future when everything will be abundant through technological innovation. Imagine 3D printing disrupting the proprietary goods market. Imagine energy being in abundant once renewable energy becomes successful and commoditizes the market. All major market segments are going to be disrupted by the economics of abundance and it is time for companies to get used to competing in such markets. Red Hat (disclosure: I am employed by Red Hat) is a pioneer in inventing a business model that is sustainable in such an abundant world. It will not be same as Oracle’s and IBM’s business models and the numbers will be far off. Comparing OSS companies with proprietary companies doesn’t give any insights into the underlying dynamics.